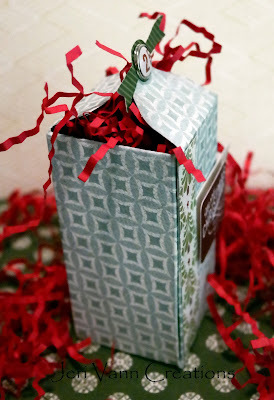 Did you know you could create a gift bag out of the Gift Box Punch by We R Memory Keepers? 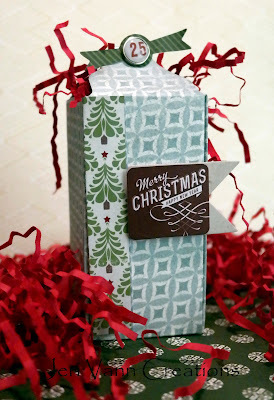 Create a gift bag like this with the So This Is Christmas Paper Collection by Carta Bella, Layered Stickers and Brads. Just choose the size you want from the handy chart on the Gift Box Punch, and follow the directions. Except, don't use the reverse punch to create notches in the flaps. Fold and secure 2 of the fold inside, and then with the other 2 you can punch a small hole in the tips and use a brad to hold them close. Or if your gift is a little larger then this, just fold and secure all 2 flaps inside and add a cute handle!